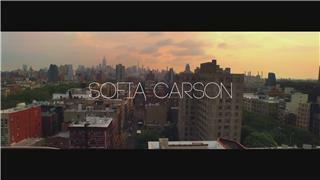 Sofa Daccarett Char, better known as Sofia Carson (born April 10, 1993), is an American singer and actress. Her first appearance on television was as a guest star on the Disney Channel show, Austin & Ally. In 2015, she appeared as Evie, the daughter of the Evil Queen, in the Disney Channel Original Movie, Descendants and reprised her role in its 2017 sequel, Descendants 2. In 2016, she appeared as Lola Perez in Adventures in Babysitting, Melanie Sanchez in Tini: The Movie and Tessa in A Cinderella Story: If the Shoe Fits.